The nationally supported Move to Amend proposed constitutional amendment declaring that corporations are not people and money is not speech received additional support recently. Oregon's Rep. Earl Blumenauer has signed on to HJR48 (We the People Amendment) as the sixth co-sponsor. The chief sponsor is Rep. Richard Nolan, D, MN. For those of us in Oregon, please use this occasion to contact your US Representative and ask them to follow Rep. Blumenauer's lead, and to ask our US Senators to introduce HJR48 into the Senate as well. Find contact information here. And a call to Rep. Blumenauer is certainly in order as well to thank him for his stand for the people's democracy. While on the phone or writing the email, ask that he also issue a press statement and put this issue on the front page of his recently redesigned website. As a Move to Amend supporter we need your help persuading House Speaker Tina Kotek to allow HJM 2 to move forward. Here's the background. A convention will be called to propose an amendment to the Constitution when at least two-thirds of the states apply for it. Either way it’s proposed, three-quarters of the states must ratify any proposed amendment for it to be added to the US Constitution. 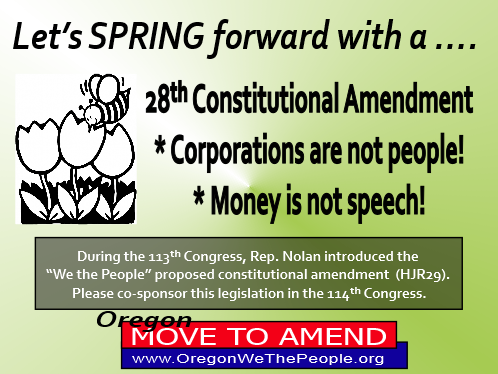 Along with numerous other states, Oregon already asked its congressional delegation for an amendment that would say corporations are not people and money is not speech by passing HJM 6 in 2013. With the exception of Minnesota's Nolan and Ellison introducing HJR 48 in this session of Congress, our congressional delegations are apparently unwilling or incapable of introducing such an amendment. So, now it’s time to escalate our demands to the second stage. An application for an Article V Constitutional convention was introduced by Wolf PAC into the legislative session as HJM 2 and amended at the legislature's request to include MTA language. As amended, HJM 2 now calls for an amendment convention to address both corporate constitutional rights and allowing money spent in the political process to be regulated by Congress and the states. When this measure passes, Oregon will have exercised both options described in the U.S Constitution to rescue our American Democracy and will join with a growing number of other states that have done both. Unfortunately opponents of this reform have been parroting the talking points of The John Birch Society and creating unsubstantiated fear about an amendments convention to undermine support for HJM 2. As a result, this resolution is being held hostage by Oregon House Speaker Tina Kotek, who apparently has decided to kill the bill, despite the fact that a clear majority support our resolution in the House. The goal of this lobbying campaign is to persuade Speaker of the House, Tina Kotek to allow a vote on HJM 2 in the House Rules committee. The Department of Justice, the American Bar Association, and the Congressional Research Service all agree you can hold a limited single issue convention. The amendments convention called for in HJM 2 would only address corporate rights and the regulation of political spending. Irrational, unsupported fear of an uncontrolled, run-away Article V Convention has been used by opponents of many issues since the 19th century to thwart progress. Any radical amendments that may come out of the convention would have to be ratified by three-quarters of the states. If you are a Democrat, remind her that an amendment with the two MTA pillars has been the first or second Legislative Action Item of the last two Democratic platforms. Is she a good Democrat? If your legislator is a Republican remind him/her that the revised HJM 2 takes Constitutional rights away from "artificial entities" that include unions, not just corporations! 2. Contact your representative AND senator and ask them to urge Tina Kotek to let HJM 2 have an up or down vote in the House Rules committee. Our US Senators and Representatives need to hear that we support a 28th constitutional amendment. Click the post card above for instructions on how you and/or your congregation can help. 2016 Initiative Campaign - Join us now! The 8 Oregon Move to Amend Affifiates have begun an initiative campaign to allow all Oregonians to voice their support for a two-pronged 28th constitutional amendment. Learn more on this campaign at www.OregonWeThePeople.org.